For some reason, there is dogged resistance by the ANC and government against classifying the violence and looting in Soweto and other areas around Johannesburg as xenophobia. Although most of the looting was directed at foreign-owned shops and foreign nationals have fled the affected areas in fear of their lives, the attacks have been deemed “just criminality”. ANC veteran and former Robben Island prisoner Ahmed Kathrada disagrees. “The attacks are xenophobic, and xenophobia is racism,” Kathrada said. What’s more, it is the ANC’s responsibility to stand up against any form of racism in society, as it has done so decisively in the past. Kathrada spoke to RANJENI MUNUSAMY about this matter that troubles him deeply. Ahmed Kathrada is 85 years old. He is one of three surviving Rivonia trialists. Most of the legendary political leaders of his generation have passed on. He participates in South African life as much as he can, from keeping the memory of the struggle years alive advancing the human rights cause through the work of his foundation. In November, Kathrada spoke at the 125th anniversary of the birth of Jawaharlal Nehru in New Delhi and in December he walked seven kilometres in Pretoria’s blazing heat in the Nelson Mandela Remembrance Walk. Kathrada has managed to steer clear of contemporary politics and always responds to questions about current controversies by saying: “I am just an ordinary member of the ANC”. And why should he be dragged into the muck when he has served his time – literally, for 26 years – and stepped back to enjoy his golden years? But Kathrada is troubled by the violence and looting of the last week in Soweto, parts of the West Rand and in the Vaal. He is particularly worried by the aversion to seeing the attacks on foreign nationals for what it is – especially after the xenophobic violence of 2008 when 62 people died. “From what I see and hear from friends in the townships, you can’t dismiss what is happening as criminality. 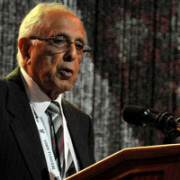 To a large extent it is xenophobic,” Kathrada told Daily Maverick on Tuesday. He said while he did not have first-hand knowledge about the recent spate of looting of shops, it seemed to be aggravated by competition between local and foreign-owned businesses. He said in some cases, foreign nationals are more experienced in business, have more resources and therefore can sell their goods more cheaply than the locals. “That is a ready-made complication,” Kathrada said. He said he was concerned about the “absence” of the ANC in handling the matter. “Our Constitution and ANC policy is very clear. It emphasises building a non-racial, non-sexist society. “We need to bear that in mind all the time and not fall prey to anything that smacks of racism. Xenophobia is racism – you can’t get out of that,” Kathrada said. Government leaders and the police have repeatedly referred to the attacks and looting, which have so far resulted in six deaths and 178 arrests, as “criminality”. The Gauteng government, led by Premier David Makhura, has taken the lead on the matter, visiting affected areas and addressing migrant communities. ANC secretary general Gwede Mantashe accompanied Makhura and Johannesburg Mayor Parks Tau to Doornkop on Friday. EyeWitness News (EWN) reported that Mantashe called for calm and said there was a need to improve immigration legislation. “[We must have] very tight immigration laws because as visitors that we must welcome [they] must also come here lawfully and be documented,” Mantashe was quoted by EWN. But that was the extent of the ANC’s involvement. In a week when the ANC issued media statements demanding to know what relationship Democratic Alliance leader Helen Zille had with Hawks boss Anwa Dramat and congratulated Amajita, the under 20 football team for their win over Finland, there was no statement issued on the Soweto violence. When Daily Maverick queried this, considering reports of another upsurge of xenophobic violence in South Africa had made international news, ANC spokesman Zizi Kodwa said the ANC had issued a statement on it. He did not respond as to when the statement was issued, as none was distributed via email on the ANC’s media distribution list or is reflected on the ANC website. Kathrada said he understood the ANC’s role to be actively promoting race relations in the country, as the organisation’s central policy was non-racialism. “I only saw Winnie (Madikizela-Mandela) there,” Kathrada said, pointing out that when there is such instability in communities, there had to be leadership from the ANC, NGOs and civil society. 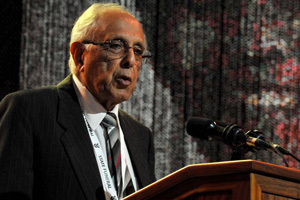 Kathrada recalled the political intervention in 1949 when riots broke out between Africans and Indians in Durban. The violence started after a fight between two boys, one Indian and one African and resulted in a wave of violence in which 142 people died. Over a thousand people were injured. “ANC leaders, together with the leadership of the Natal Indian Congress (NIC) and the Transvaal Indian Congress (TIC), were in the thick of things,” Kathrada recalls. He had driven some of the TIC leaders to Durban at the time. “They helped to curb the rioting,” he said. One wonders what prevents the ANC in 2015 from saying the same. Back in 1949, a commission of inquiry was appointed to investigate the riots at which the ANC and South African Indian Congress appeared jointly. This sent out a powerful message to the communities they represented. It was what was expected from political organisations defined by circumstances but working towards a non-racial society. Kathrada said it also took active political intervention in 1993 to prevent attacks on white people after the assassination of Chris Hani. “We were on the edge of widespread violence like never before,” he said. Then Madiba stepped in with a television address to the nation, pleading for restraint and discipline. “A white man, full of prejudice and hate, came to our country and committed a deed so foul that our whole nation now teeters on the brink of disaster. A white woman, of Afrikaner origin, risked her life so that we may know, and bring to justice, this assassin,” Mandela said. Kathrada said South Africa was still a society with deep-seated prejudices and racial divides. “I am an Indian and I am ashamed that among people I know, the ‘K word’ is still used.” He said it also concerned him that while it was common practice for white families to adopt black African children, Indian families rarely did so. “We have a long, long way to go. The (Kathrada) foundation does some work but it is a small organisation. The ANC and Cosatu can do much more.” He said race relations, historically and otherwise, should be taught in schools from primary level upwards. “Ideally it should start at home,” he said. As measured and as gentle a giant Ahmed Kathrada is, there is no running away from the truth that his words spring and the many, many more uncomfortable questions that they deliver down the stream of his wise thoughts. Where, indeed, is the courage to tell the truth, uncomfortable as it is; where is the leadership to take on the tough issues head on, instead of hiding behind formalities; where is the wisdom to understand that the resolute police reaction is indeed only the beginning, not the resolution and the end of it; where is the commitment to protecting our own people of the rainbow nation from the ugly spectre of soul-poisoning xenophobia? Until true leaders stand up and speak out to influence and change violent and rogue mindsets in our society, such errant and evil behaviour will recur, to our collective shame. Xenophobic looting: ‘The country must look’ Chapel Hill shooting: What’s the definition of a hate crime?